Alternate Cover Edition 0023957107 / 9780023957109 A critique of the work of The Great Gatsby. An american classic. pt. 1. The novel -- The great Gatsby -- pt. 2. Intention and genesis : the author's view -- Absolution / F. Scott Fitzgerald -- The untrimmed Christmas tree : the religious background of The great Gatsby / Henry Dan Piper -- Letters about The great Gatsby -- [An int Alternate Cover Edition 0023957107 / 9780023957109 A critique of the work of The Great Gatsby. An american classic. pt. 1. The novel -- The great Gatsby -- pt. 2. Intention and genesis : the author's view -- Absolution / F. Scott Fitzgerald -- The untrimmed Christmas tree : the religious background of The great Gatsby / Henry Dan Piper -- Letters about The great Gatsby -- [An introduction to The great Gatsby] / F. Scott Fitzgerald -- The craft of revision : The great Gatsby / Kenneth Eble -- pt. 3. 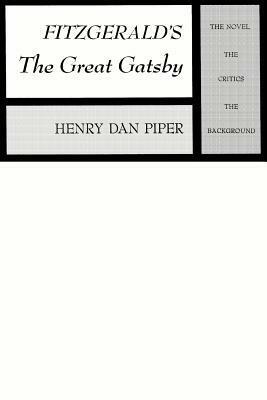 Achievement : the critics' view -- The great Gatsby / H.L. Mencken -- The great Gatsby / John M. Kenny, Jr.-- New York Chronicle / Gilbert Seldes -- [The great Gatsby] / Arthur Mizener -- The romance of money / Malcolm Cowley -- F. Scott Fitzgerald's The great Gatsby : legendary bases and allegorical significances / John Henry Raleigh -- Color-symbolism in The great Gatsby / Daniel J. Schneider -- The greatness of "Gatsby" / Charles Thomas Samuels -- Patterns in The great Gatsby / Victor A. Doyno -- pt. 4. The Jazz Age and The great Gatsby -- [The Fuller-McGee case] / Henry Dan Piper -- The New York Times reports the Fuller-McGee case -- [New York in the 1920's : Arnold Rothstein and his circle] / Lloyd Morris -- Jay Gatsby's hidden source of wealth / John H. Randall III -- Fitzgerald's Jay Gatz and young Ben Franklin / Floyd C. Watkins -- [Rules for self-improvement] / Benjamin Franklin -- The self-made man in American / Irvin G. Wyllie -- [The end of the American dream] / David F. Trask.